THREE CAR GARAGE is the new thing for extra space. 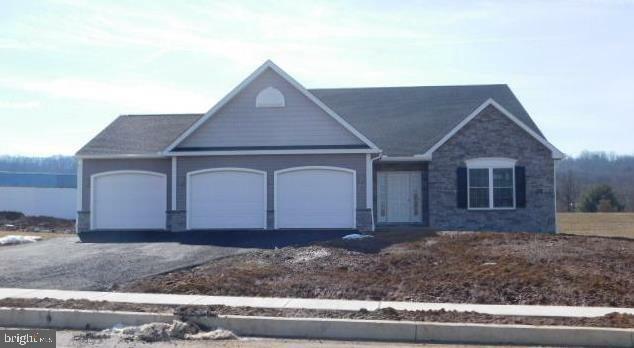 New upscale community by Grande Construction in Fleetwood, PA. This 3 BR 2 BA newly constructed, custom ranch model with THREE CAR GARAGE is in walking distance to schools, park and community pool. Spacious flowing floorplan includes family room with cozy fireplace and adjoining kitchen with island great for pulling up a stool and enjoying an after school or midnight snack. Master bedroom has vaulted ceiling, fantastic master bath with custom tile shower and large walk-in closet. Two additional bedrooms down the hall and a full hall bath. Some of the upgrades include custom paint, hardwood in dining room, chair rail and tray ceiling. Exterior features includes a quaint covered patio! Many more models also available on additional lots.